When your onions finish developing. When they’ve finished developing, you’ll notice the lowest leaves start to yellow and wither. Shortly after, the stems will flop over at the neck, as if all your plants had just died. The onions won’t look very appetizing either. Fear not. Wait for most of your crop to flop, then bend over the stems of any remaining upright plants. You can simply bend them above the bulb; this will signal the plants to enter dormancy. On a dry, sunny day, carefully pull each onion out by the bulb, or by digging around it. Grasping the weakened stem could cause it to pull off entirely, and you want the stem intact to reduce the likelihood of rot. Lay the onions out on the ground, or in another open, sunny area, for a day or two to dry out the roots. 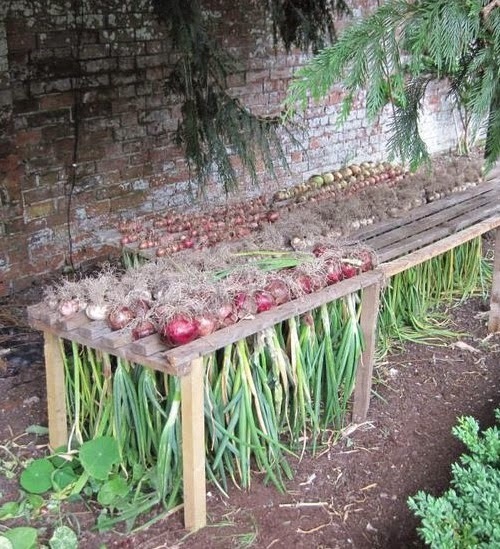 After a nice day of getting their tan on, move the onions into a breezy, shady spot (such as a covered porch, or under a tree) and lay them out one by one. You don’t need to clean off the onions yet. Just set them out to dry, dirt and all, until the stems turn brown and brittle. This rest period allows the onions to go deeper into dormancy so that they’re less susceptible to disease. If you have absolutely no shade around your house, you can lay them in the sun but covered with a thin cotton sheet (never plastic or canvas, which could stifle them) to prevent sunburn. If you tend to get rain in the summer, you can cure your onions in a garage or basement, but turn them over a couple times a week to ensure even drying. The important part of curing is having plenty of air circulation around the bulbs. Because of this, it’s best to lay them out without crowding them, rather than heaping all your onions into a basket. This last step of the curing process takes two to three weeks. You want your onions dry, dry, dry. The roots will become wiry and the papery outer skins will tighten around the bulbs. Now you can clean ‘em up by trimming off the roots and stems with shears. A couple layers of the outside skin will usually flake off with the stems, leaving you with a smooth, spotless onion.